In one sense, the West Linn girls basketball team didn't get what it wanted from the Class 6A state tournament. The Lions went 1-2 in the three-day tournament, held March 7 through March 9 at the Chiles Center on the University of Portland campus. But in another sense, West Linn got exactly what it wanted at state. It faced off and held its own against three of the state's best teams, it won a trophy for a second straight year by finishing sixth, and best of all, the Lions got to play together three more times and revel in the excitement of the game they love and do it on the state's biggest stage. Fourth-ranked West Linn finished its tournament with a battle against Three Rivers League champion Tigard, the state's second-ranked team, eventually dropping a 44-34 decision on Saturday. "We're proud," said West Linn junior Elisabeth Dombrow, who finished with eight points, three rebounds and two assists. "Whether it was fourth place or sixth place, I'm just so proud of this team and how far we've gotten. We are so young and so just making it to the Chiles Center was a great accomplishment." "Just making it to the Chiles Center is a big deal," West Linn senior Katie Schoenborn said. "My first two years, we didn't make it here so it's a really big deal, even just being in the top eight of the state." 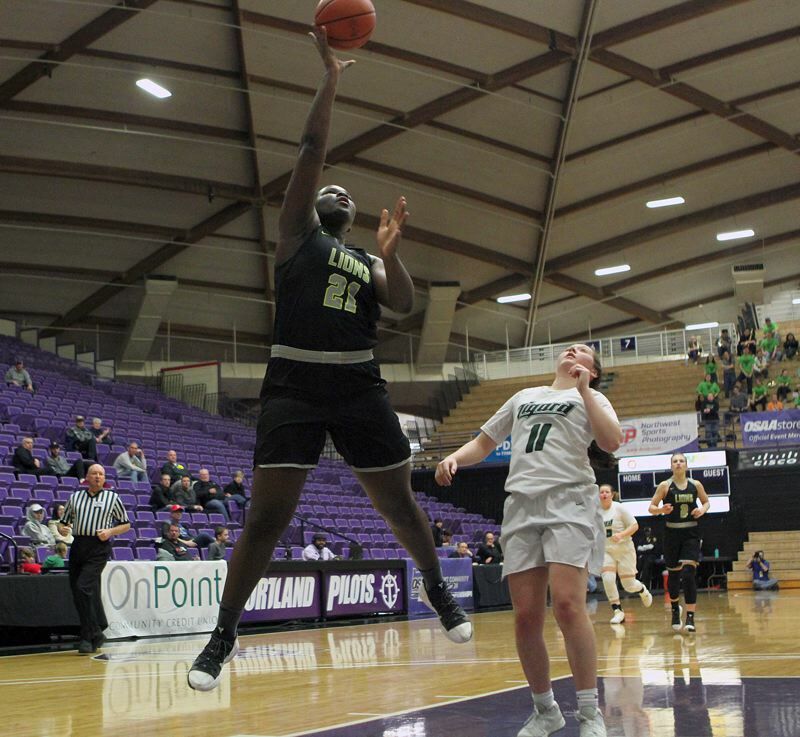 "There's a lot of good teams in the state and just getting to be here and be one of the top eight teams is an accomplishment," said West Linn sophomore post Aaronette Vonleh, who led the Lions with 10 points, along with five rebounds and two steals. "And to be able to play again on Saturday for fourth and sixth place is still a good accomplishment. We knew going into it, if we won or lost, we'd still made it pretty far." With the loss, West Linn finished its season with a final overall record of 21-8 after earlier placing second in the TRL. Tigard, meanwhile, finished its season with an overall record of 26-4 and the fourth-place trophy for a second straight year. "That was a really, really fun game," said Tigard senior guard Campbell Gray, who scored a game-high 24 points and also grabbed seven rebounds. "The goal here always is to play three games and end on a win. We did that. We came out with a lot of energy today. It was a league opponent … so we really wanted to get that win. The last time we played them, they beat us by two, so this was a little bit of payback." "It was very exciting," said Tigard senior post Dani Lyons, who made five 3-point baskets on her way to scoring 17 points. "For as important that this was, beating West Linn, it was more important to go out there as a team and play together, which we did. So that was really exciting to go out like that." Tigard, although fired up to play West Linn, entered the game a bit undermanned. Starting guard Kennedy Brown was out with a knee injury suffered against Jesuit, and Tigard didn't know how much Gray would play either after she got just five second-half minutes against Jesuit due to a lingering ankle injury. "We knew we weren't going to have Kennedy and didn't know how much we'd have Campbell," Lyons said. "We knew that she'd go out there and give everything she had, but we weren't too sure what that was going to be. So we all knew that we had to step up more than usual. And, we all did." As it turned out, Gray was ready to go and she showed it right away, scoring seven points in the first quarter. Vonleh also got off to a strong start, scoring six points in the opening 3 minutes and 33 seconds of the game. But Tigard, with Lyons sinking a pair of 3-point baskets in the period, took a 14-11 lead to the second quarter. That's when the Tigers started to take charge. Tigard sophomore Ajae Holdman opened the period with a basket off a baseline drive, and Gray then scored seven unanswered points that gave Tigard a 23-11 lead with 2:42 left in the quarter. Meanwhile, West Linn missed its first six shots from the field in the period and didn't score until Vonleh sank a four-foot jumper with 2:16 left before halftime. Tigard answered with Lyons' third 3-pointer of the first half, a shot that helped the Tigers take a 26-15 lead at the break. But the Lions came roaring back in the third quarter. West Linn sophomore Audrey Roden opened the period with a 3-pointer, and she followed that with a jumpshot from the foul line. Sophomore Cami Fulcher then added a pair of free throws, cutting the Tigard lead to 26-22 with 4:00 left in the quarter. Gray scored five straight points to end the West Linn run, but the Lions closed out the period with five straight points by Dombrow, including a 3-pointer with 18 seconds on the clock that cut the Tigard lead to 31-27 going into the fourth quarter. "We got a little too far ahead of ourselves," Lyons said. "We were up by 11 and we were thinking 'We have this.' But they fought back. We were in a little bit of a lull. That's how basketball goes, but we got going again." Gray opened the final stanza with a 16-foot jumper, then, on an ensuing Tigard possession, Lyons got to the left corner and swished her fourth 3-pointer of the game to give the Tigers a 36-27 lead with 5:50 left in the contest. Lyons then made another 3-pointer off a Paige LaFountain pass and boosted the lead to 41-31 with 3:11 left to play. From there, Tigard added a free throw from Gray and two foul shots by Lyons with 56.4 seconds remaining to wrap up the 44-34 victory. "We all knew, with this being our last game, that we all needed to put everything out there," said LaFountain, who scored just one point but added six rebounds and three assists. "We had nothing to lose, and credit to Dani for hitting so many '3s.' We always knew she was a good shooter, but going off like that, we're so proud of her, and very happy. It was great." "We had a strong start and Dani was phenomenal," said Gray, who went 7 of 11 from the field. "She's such a good shooter. This year, she started shooting from the outside more and she's so, so good. That gave us such a boost, such a lift. When Dani would hit a '3,' everyone got so excited. That was crazy." Holdman also had five of her game-high nine rebounds on the offensive end, giving the Tigers some crucial extra opportunities. For West Linn, Vonleh scored all of her team-high 10 points in the first half. Fulcher and Dombrow each scored eight points, with Fulcher also having four assists. Roden scored five points and sophomore Payton Shelstad had three. "We struggled moving the ball offensively and attacking the rim," Dombrow said. "Campbell got a lot of fouls off attacking, so we thought that we needed to do the same thing (to Tigard). So just getting to the hoop and dishing and moving the ball on offense was key. They are all great players and great shooters. You can't leave any of them alone." "We just had to figure a way to lock down Campbell and Dani Lyons because they had most of their points so that was our main focus, and on offense, it was just getting to the basket and getting fouls because the foul count was a little bit off," Vonleh said.